ace: Kayser, this has been a huge project and I want to start off by saying thank you for your hard work. Trust me, these ingrates will never realize how much work you've put into this. Why don't you tell us about how this came about before we get down to the nitty gritty. Kayser: I have only been at this for two and a half seasons now, but it’s carved out this large corner piece of my life. I keep my phone out on my desk with the chat open for parts of the day. My managing director has asked me what a DaddyLeague is and if he should be worried about my browsing history. I fire up madden when I walk through the door to my apartment to check on stats, news, and to comb practice squads and free agents. Over the past few weeks things have slowed a bit and we are no longer on the power 24 hour advance kick so I found some free time. That free time coupled with ace asking how I would rank the league got me thinking. When I sat down to complete my ranking, I first compiled a scoring system for each team and their consistency over the past 3 seasons. I then used this order to start plucking away at what team I thought went where. The top 4 or 5 were a breeze. Once I hit 6 it was a nightmare. I started to look at quality wins, quality losses, and negative losses. The data started to pile up and the entire idea of ranking 32 teams turned me off and I shut down the computer. Next time I opened up the spreadsheet, I started to look at players and remembered some owners didn’t like the current way players were ranked for OVR. After a few hours I developed a system that only highlighted specific attributes and did away with secondary traits. When I noticed the task was mounting again, I asked ace for a little help. I got A LOT of help. I was primarily focused on the player ranking, and then ace started asking me about the full league ranking I abandoned, and then everything took off. Over a week we bounced ideas off of each other and the ranking kept getting more extensive until we finally put a hold on building out and focused on the ideas we already had. ace: Excellent. Thanks again Kayser. So let's get to it! First of all, see below for an overall view of the league. Most is self-explanatory but you will wonder what the heck is "Consistency" and what the heck is "DWHO Score"? Consistency: I developed a formula to help us put a value to how consistent a player is in the league. Basically, the closer to 1 you are, the more consistent your play. Take the Titans for example. They have consistently played right in the middle of the road, steady over multiple seasons. On the other hand, look at the Bills. They've been everywhere from great to below average and that is reflected in the Consistency column. DWHO Score: This value is what most would consider your power ranking value. It is a function of each season's finish, range, consistency, and puts a heavy weight to current standing in the league. It is important to note that previous rankings were judgment based. This is all math. Only YOU can improve your ranking. * Note: I took the liberty of swapping Lions and Raiders rank in 2017 because I felt it better represented the player. Kayser: This project has turned into a collaboration that is just going to keep getting enhanced. One thing I learned from ace is the sky is the limit; you just have to present the challenge to him. I hope you guys enjoy the first edition which highlights the best division in the league, the AFC North. Feel free to throw any ideas our way. We will be back with the first NFC division in the next installment. 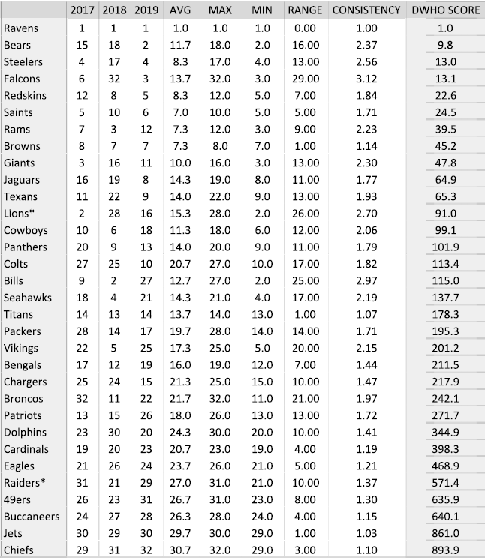 And now, please see the links below for AFC North team overviews and another copy of the full ranking since the quality on the one above is so bad. Speaking for Kayser, we hope you enjoy the fruits of our labor and we look forward to your feedback. Forgot to explain a few things. We all know EA's positional ratings are not the most accurate representation of a player so Kayser developed his own rating formulas for each position using primary attributes and modifiers to calculate his own proprietary rating. The truth is there is no way to perfectly evaluate a player but we felt these were closer than what EA provides us. The mechanics of those formulas is unimportant and quite frankly would lead to unnecessary criticism so we'll keep those formulas private. Those individual ratings are then combined to calculate a raw offense and raw defense grade, basically an average of position scores. Upon further review, we realized the raw grade was not completely representative of the offensive or defensive team's performance. For that reason, we developed a modifier based on offense or defense rankings and applied a modifier to the raw grade. So, you may have a stud defense, but if you perform poorly with them by allowing tons of yards and points as compared to the rest of the league, your modified grade is effectively lowered. Hope that makes some sense and I'm happy to explain how we arrived at our conclusions in more depth if necessary.